Saint Benedict was born at Norcia, Italy around 480 AD, four years before the Western Roman Empire formally fell. Benedict was widely regarded as having deep and wide human feeling and his moderation. After attending primary schools in Norcia, Benedict went to Rome to study literature and law. In his later years and after being disenchanted by the nature of man, he retired with a group of priests and later went into seclusion for three years in a cave. A group of shepherds and common men, began to follow his teachings and the pastoral and thus the apostoli c principles of the Benedictine Order took root. After founding twelve communities of monks at Subiaco, Italy, Benedict traveled to Montecassino where he established a monastery and wrote “The Rule.” This simple set of guidelines for how the life of a monk should be lived has become one of the most influential works in all of Western Christendom. 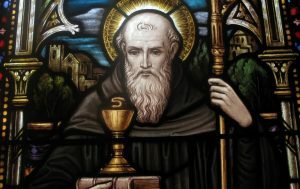 Saint Benedict devoted himself to evangelizing the local population who practiced pagan worship. Shortly before he died, Saint Benedict saw the soul of his sister Saint Scholastica rising to heaven in the form of a dove.